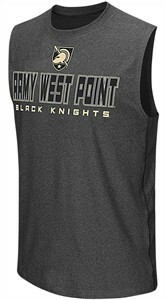 Stay cool during your workout or run in this Army Black Knights Architect Sleeveless Tee Shirt from Colosseum which comes in heather charcoal. The Black Knights Sleeveless Tee is made from 140 gsm. Featherweight 92% Polyester/8% Spandex material for a comfortable fit and feel that will keep you cooler and comfortable no matter what your activity. This Synthetic Mens Top features back neck taping, a color contrasting side panel, and a front Black Knights Rubberized/Reflective Print. Official Pro & College Sports Gear at Great Prices!